Ceres seating began with scientific research on how people sit. The end result is a superior sitting experience – and a stylish, beautiful chair. The aesthetic integrity of form that follows function gives Ceres its clean, purposeful appearance. 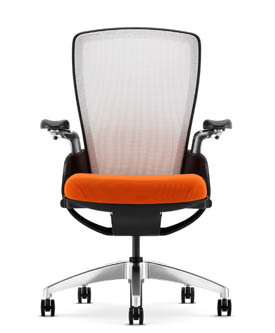 Its contours and shape exist to support you completely as you move throughout your workday. As a bonus, Ceres also has the aesthetic flexibility to reflect just the right personality for practically any workplace environment. Arm stems available in Textured Black, Textured Platinum Metallic and Polished Aluminum. Bases available in Black and Polished Aluminum.